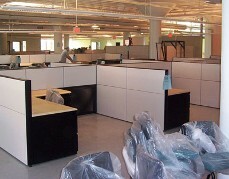 American is your one-stop resource for all your office furniture needs. American Manufacturing, Inc. and American Delivery & Installation, Inc. are the one-stop office resources for your office furniture needs. We have custom laminate manufacturers, furniture installers, movers, space planners, designers and project managers on staff who can take care of a company’s furniture needs from start to finish. American has the systems, capacity and management expertise to meet and exceed all of your expectations.